George Leonard Johnson was born on 25 November 1921 in Hameringham, Lincolnshire, the sixth and last child of Charles and Ellen Johnson. He was known as Leonard to his family, but when he joined the RAF he was nicknamed “Johnny”, and this is the name by which he is mostly known now. His father was a farm foreman, living in a tied cottage and the family grew up in very poor conditions. Ellen Johnson died when Johnny was three, and his family life was very disrupted. Eventually his older sister Lena moved back home and he went to a local primary school in Winthorpe. At the age of 11 he was sent as a boarder to the Lord Wandsworth Agricultural College in Long Sutton, Hampshire. At the time, this was a run by a charity catering for the children of agrocultural families who had lost one or both parents. He did reasonably well at school and passed the School Certificate as well as playing cricket and football, and winning several athletics events. When he left school in December 1939, he started work as a park keeper in Basingstoke. Johnson volunteered to join the RAF in June 1940, applying to become a navigator. He was, however, selected for pilot training. Eventually he joined up in November 1940, but the actual training took some time to materialise, since there was a huge bottleneck, so he was posted to various establishments. There was some compensation for all the moving around – at one posting, in Torquay, he met the woman, Gwyn Morgan, who would later become his wife. In June 1941, Johnson was eventually sent for pilot training in Florida. More than one-third of those selected for pilot training were eventually “washed out”, which was what happened to him. As he always doubted he had the necessary skills, he was not surprised and he opted for air gunner training instead, when he arrived back in the UK in January 1942. In July 1942, Johnson was posted to 97 Squadron at Woodhall Spa. He was designated as a spare gunner, without a regular crew, and so he flew with various skippers if one of their own gunners went sick. His first operation was on 27 August 1942, flying with the highly experienced Sqn Ldr Elmer Coton on a trip to Gdynia in Poland. However, an engine failure en route led to an early return, so the first time he saw action was the following day, on an operation to Nuremberg. 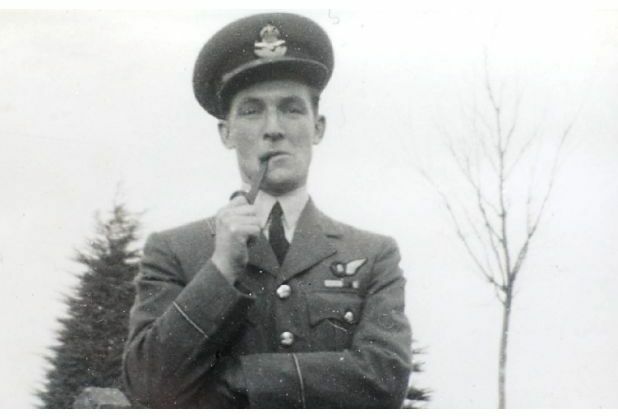 Johnson flew on a handful of operations but then the opportunity came up to train as a specialist bomb aimer, on a course at the nearby base of Fulbeck. He completed this course in late November 1942. Within a month, a vacancy for a bomb aimer came up in Joe McCarthy’s crew. At first Johnson wasn’t keen on flying with an American captain, but a conversation with McCarthy changed his mind, and he was introduced to his future crewmates. What united them, he wrote later, was the fact that they all had inbuilt confidence in McCarthy whom they regarded as the best pilot on the squadron. Johnson’s first trip with McCarthy was an operation to attack Munich on 21 December 1942. It was packed with incident. In appalling weather, they were attacked by fighters and on the return trip lost complete power in one engine and suffered problems in another. They were forced to land at Bottesford. Johnson went on further 18 operations with McCarthy, which brought him to the end of a full tour with 97 Squadron. Knowing that he would then be entitled to some leave followed by six months working in a non-combat training role, he and Gwyn arranged their wedding for 3 April 1943. The ceremony was nearly called off when the whole crew were transferred to 617 Squadron for a new secret mission, and all leave was cancelled. His new CO, Guy Gibson, however relented, and gave them four days off. In all the training for the Dams Raid Johnson practised dropping the mine as their aircraft flew straight towards the target at low level. However, on the afternoon of Sunday 17 May, when the five crews detailed to attack the Sorpe Dam received their briefing they were told that they had to fly along the dam wall and drop their mine at its centre. It would roll down the wall and explode when it reached the correct depth. Following the delay in setting off and the switch of aircraft to AJ-T, they realised that they were the only crew which had got as far as the Sorpe Dam. McCarthy soon realised how difficult the attack was going to be, even though there were no flak batteries present to defend the dam. The approach involved flying over the small town of Langscheid, which had a prominent church steeple, and then dropping very low so that the mine could be dropped in the exact centre of the dam. It took a while to get the approach correct but eventually, on the tenth try, McCarthy managed to make a near perfect run, getting down to about 30 feet. Johnson released the weapon, and shouted “Bomb gone”. Although AJ-T had failed to breach the dam, McCarthy, Johnson and navigator Don MacLean were all decorated for their part in the raid. Johnson received the DFM and travelled up to Buckingham Palace for the investiture. As a non-drinker, he didn’t participate in the festivities that followed. Johnson was commissioned in November 1943 and went on to fly with McCarthy on all his subsequent 18 operations with 617 Squadron up until April 1944. At that point, knowing that Gwyn Johnson was shortly to have their first child, McCarthy insisted that he stand down. Reluctantly, Johnson agreed and was sent back to Scampton as a bombing instructor and served out the rest of the war in various training jobs. After the war, he was told that if he qualified as a navigator, he would get a permanent commission. He accepted this offer, and stayed in the RAF until 1962, retiring with the rank of Squadron Leader. Johnson then retrained again, this time as a teacher. He worked first of all in primary schools and then later in adult education, including a period teaching psychiatric patients at Rampton Hospital. When Johnny retired, he and Gwyn moved to Torquay, where Gwyn had been brought up. They became active in local Conservative Party politics, and Johnny was elected as a councillor, and became chair of the constituency party. Gwyn Johnson died in August 2005 and for a while Johnny withdrew from public life. But then he started accepting invitations from the media for interviews and documentary appearances, and now he is one of the most familiar of the dwindling number of Bomber Command veterans, and has played a full role in the recent anniversaries of the Dams Raid. George “Johnny” Johnson, The Last British Dambuster, Ebury Press, 2014, p.298. A truly great man! I corresponded with him a few years ago and I always found him to be very nice and most helpful. interesting comments, like why they avoided the toilet at 20deg. under. I have read every book that Amazon has, but “The Last Dambuster” is way in front, a very very good read, and I must congratulate Morgan Johnson, of course, for his part in this in this cracking story. An excellent account of a great British hero, who deserves a Knighthood, and a superb role model for young people today. Just one point, Joe McCarthy was a Canadian, not an American. Henry — Thank you for your comment. However, the post is correct. During the war, Joe McCarthy was a US citizen who enlisted in the RCAF before Pearl Harbor. After the war he became a Canadian citizen in order to remain in the RCAF.